Last Friday evening, 23 March 2018, the United Nations (UN) Human Rights Council concluded its three-week long session by voting to adopt a Resolution reaffirming that human rights must play a central role in the ongoing international debate on global drug policies. The resolution, put forward by Switzerland, Mexico and other core group members Albania, Brazil, Colombia, Greece, Guatemala, Paraguay, Portugal and Uruguay, requests the Office of the UN High Commissioner for Human Rights to prepare a report on the implementation of the UN General Assembly Special Session on Drugs (UNGASS) Outcome Document with regards to human rights. It asks this report to be presented to the Human Rights Council in September 2018, and notably to share the report with the Commission on Narcotic Drugs (CND) ahead of the High-level Ministerial Segment of the Commission in April 2019 which represents the next key moment in the global drug policy debate. This intends to contribute human rights expertise to discussions by the Commission, the Vienna-based policymaking body of the UN with prime responsibility for drug control matters. This Resolution is critical as it is clear that the direction of international drug policy is in dire need of a review. In the words of the United Nations Secretary-General, Antonio Guterres: ‘…it is vital that we examine the effectiveness of the war on drugs approach, and its consequence for human rights’. Consequently, the human rights system has a role to play, not least demonstrated by human rights commitments by member states in the UNGASS Outcome Document. While there is no evidence that the so-called ‘war on drugs’ has deterred the production, trafficking or use of drugs, the negative human rights impact has increasingly been recognised and reported on, including by the Office of the UN High Commissioner on Human Rights in a report ahead of the UNGASS in 2016. We continue to see prisons being filled with minor drug offenders where they languish in overcrowded conditions due to disproportionate harsh sentencing regimes. Fair trial rights are frequently flouted. Women in situations of vulnerability find themselves in prison for minor drug offences, ripping families apart. Thousands of people are held in compulsory ‘drug detention centres’, often with no avenues to contest their detention. 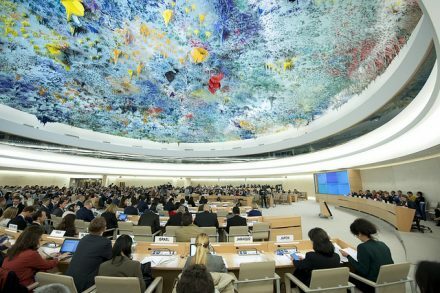 Despite the unequivocal link between the drug policy debates and human rights, the negotiations in Geneva held over several weeks were not easy, demonstrated by the oral amendments to the text that were made even in the last hour, with states holding regressive drug policies attempting to weaken it. Ultimately, the Resolution was adopted with 26 of the Council members voting Yes, 10 No and 11 abstaining, providing a critical avenue to ensure a human rights-based approach to drug policy. The Resolution also provides for enhanced coherence within the UN system, as called for by the CND in 2017. This blog post, which was written by PRI’s Policy and Programme Manager Olivia Rope, was originally published on the International Drug Policy Consortium‘s website.